SouperchefannatravelsxSpain foodie inspiration, paella my version! 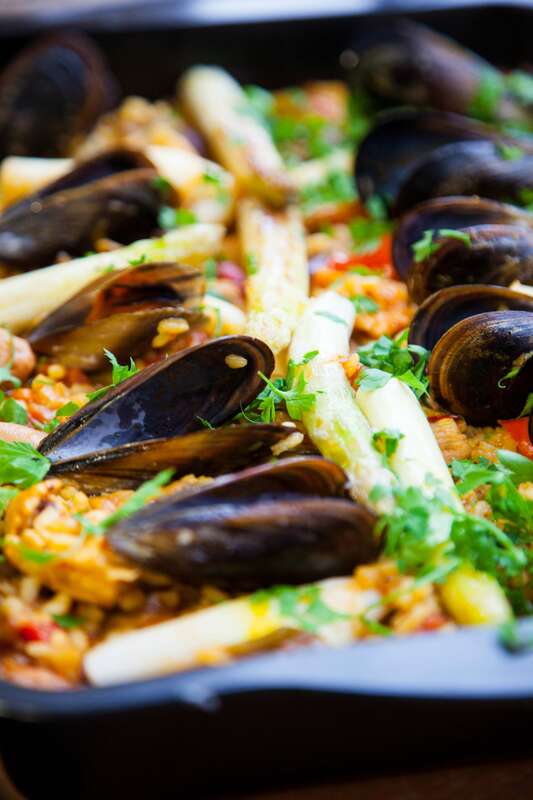 Every country has their nationalistic pride when it comes to food and in Spain’s case there is the paella. 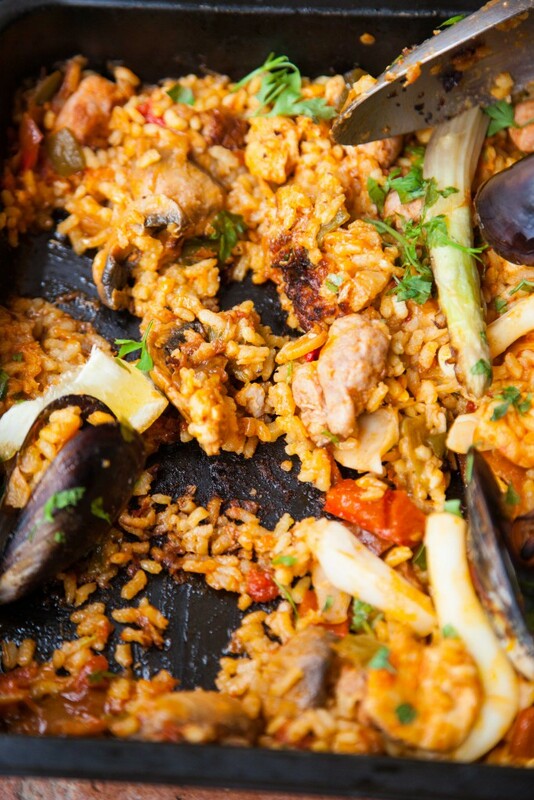 The most iconic of all, the Paella Valenciana originating from Valencia. 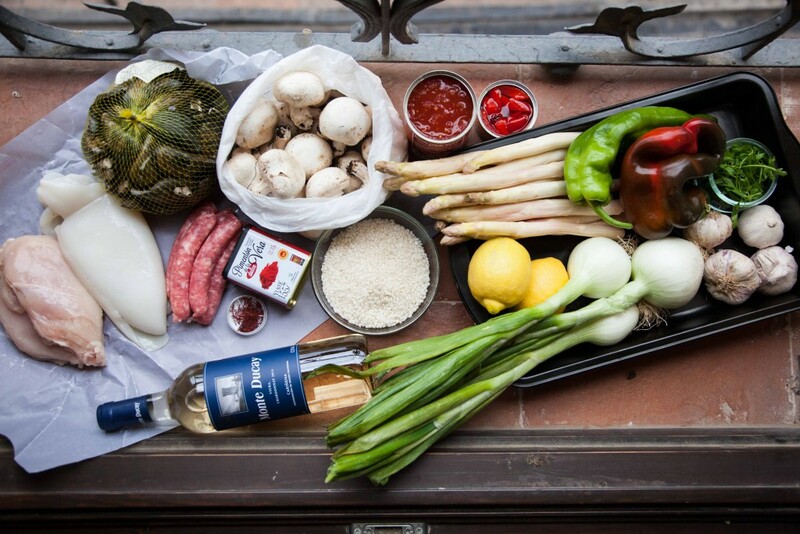 The original Valencian Paella recipe consists of a combination of chicken, rabbit, rice, green vegetables, artichokes, peppers, bomba rice, white runner beans, saffron, fresh rosemary, sweet paprika, garlic and lemon. I had the opportunity to travel around Spain recently and paella was one of those dishes that is offered in every restaurant as set lunch menu on every Thursday. 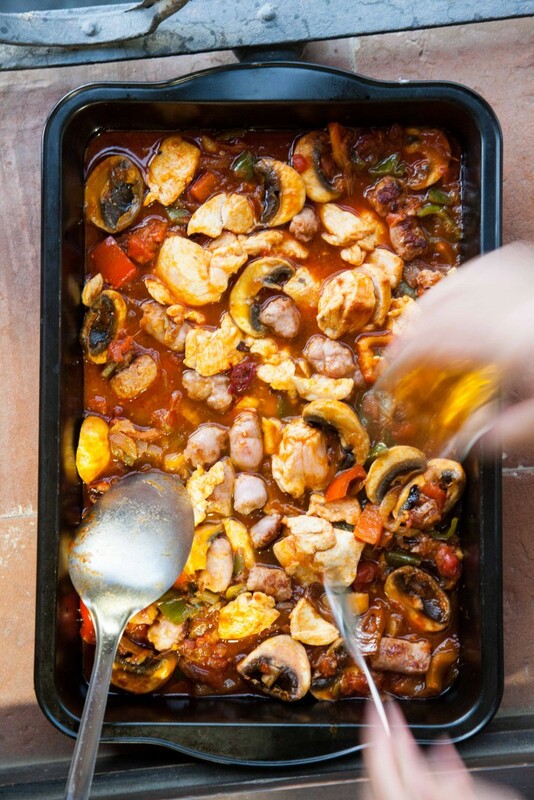 Throughout Spain, over time, the original recipe has been refined and other variations have been adapted for inland areas creating the infamous Paella Mixta which combines a variety of white meats, seafood, sausage and chorizo. The Valencians are very proud of their dish and they do not recognize this Paella Mixta as Original Paella Valenciana. In my opinion, this dish can be incredibly flexible and delicious and you can use whatever ingredients you fancy or have available and rice is medium to bring it all together. It is important to note, that paella is a rice dish with seafood, and not seafood dish with rice. The whole essence is to enjoy the flavorful rice paired with some ingredients. Normally, you would use a proper paella pan, but in the service apartment we stayed in Zaragoza, they only had a long shallow baking tray which besides its shape, was actually the right depth . So a rectangular baking dish it shall be! 1 tsp of smoked sweet paprika or sweet paprika. Heat a large paella pan or a large wide based pan or in my case, a rectangular shallow oven tray over medium heat and add the olive oil, the sliced fresh sausages and the chicken breast. Stir occasionally, and fry till it starts to take colour. Remove from the pan, leaving the oil behind. Set aside. Add the chopped peppers, onions and garlic. Fry gently until the vegetables start to soften and become translucent and mushy. This is the sofrito, the base of any good paella. Add the button mushrooms and stir to combine. Add the previously cooked sausages and chicken breast to the pan. Add the paprika and the tinned tomatoes. Keep stirring to avoid any ingredients getting burnt. Pour in 500ml fish stock, 300ml white wine, and the soaked saffron threads in hot water. Stir well. After 15 minutes the rice should be cooked, but still have a bit of a bite. Arrange the mussels and squid all over the pan. Cover with aluminium foil to allow the mussels to start to open and the squid to cook for a further 5-8 minutes. Discard any mussels that are not open. Lay on top, the grilled asparagus and lemon wedges. Stir in the chopped parsley leaves and it is ready to be served. *The rice should be medium grain. Spanish rice is rounded and short; it absorbs liquid very well, and it stays relatively firm during cooking. Those qualities make it ideal for paella, where the rice grains absorb flavor from the liquid; the rice should be dry and separate when done, not creamy like risotto. The most appreciated variety of Spanish rice is bomba. I have used arborio rice and with much success. The only thing, is not to add so much stock at the start when cooking with arborio and just add when the rice is a tad dry during cooking. Prawns or clams or any type of seafood can be used, depending on what is available. Traditionally, green peas are sprinkled on top of the paella and artichokes and green beans are commonly used. It is a matter of adding what is your favourite vegetable and what is available. It can be a simple comforting family arroz dish and it can be a flamboyant dish, a centrepiece for a flamboyant meal used to entertain your guests. The ingredients for my paella. Yes, I could feed an army! I could not believe that saffron threads are so affordable. It costed me 2 euros for 1g. I told myself I need to buy more back! 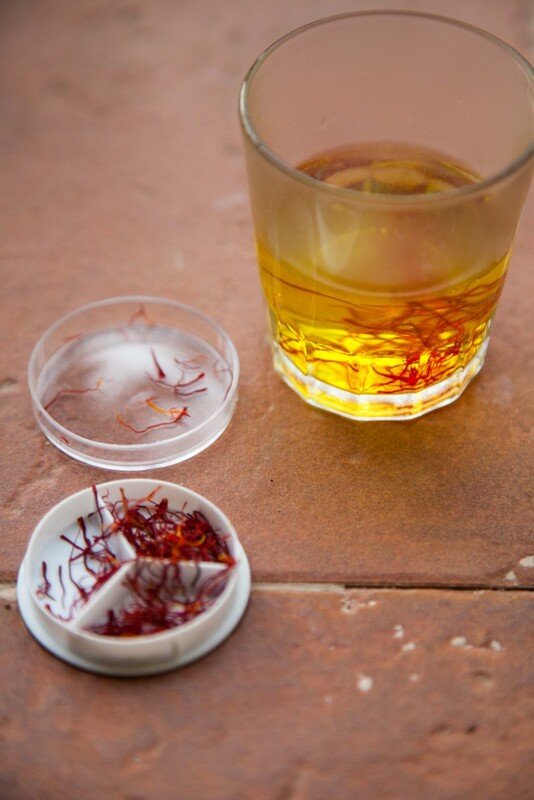 Soaking saffron threads in hot water help release its flavours and colour. 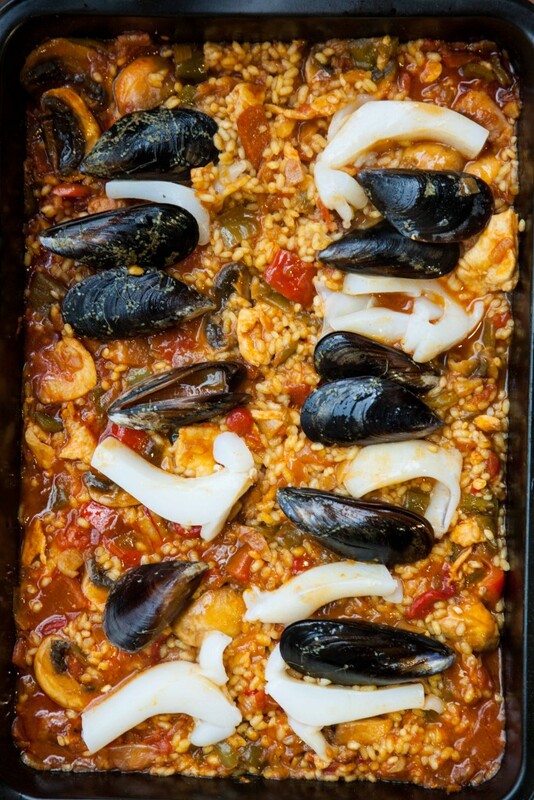 As can be seen here, this is socarrat, what dictates a good paella, a slightly caramelised crust base. I was hoping that I would be able to get a paella pan from the supermarket but unfortunately they dont sell. Found a huge baking tray which proved to be really useful. Mixed “paella” with chicken, vegetables and seafood.